Home › WWWS › What about those parties? I was talking to a neighbor who’d been talking to her neighbor whose backyard has a partial view of ours. She (the second neighbor) was complaining about “that gay couple with the drunken hot tub parties.” Now that could only be us, that is my husband and me. As it happens we are quite unaware that we’re gay and have not attended any, not even one, drunken hot tub party in our own back yard. 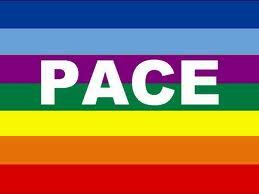 We fly the Italian peace flag (“pace” being Italian for “peace”). And we have a hot tub. She must think we have modified the rainbow flag with a reminder to pace out our debaucheries. The distressing thing is that while we try to be sociable and really do have a fair number of gatherings here, nobody has invited us to these drunken bashes. Most of our festivities (the ones we’ve attended) are fairly tranquil. Now we’ve drained the hot tub for the summer and where will our fictive friends go? What will they do? What will our neighbor’s neighbor do when all there is to watch in our backyard is zucchini and tomatoes growing and peaches ripening, waiting for squirrels to eat them?